After the sumptuous July 4thdinner at Sargam’s (my friend) place we all sat chitchatting around the dinner table. When one of the guests at the table is a fitness trainer, the discussion is bound to be about healthy eating and weight loss (which I guess most of us only aspire for…sigh!!). We all agreed upon the significance of an early and light dinner – the best bet for that of-course is a salad. Chicken, fish or seafood salads are all excellent options. Sargam complained that vegetarians are usually left high and dry with insipid options like sprouts or plain green leafy vegetables. “We have no incentive in salads”, she said and it set me thinking. Back home I thought of various ingredients that could make a tasty and filling vegetarian salad. Kidney beans looked like a good option to me. The salad turned out so well that I thought of sharing the recipe with you. 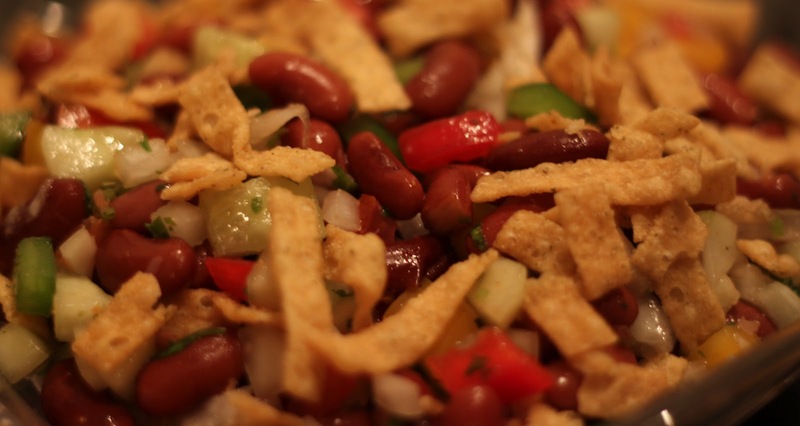 To add crunchiness add a few crushed tortilla chips – it tastes incredibly well! Enjoy!